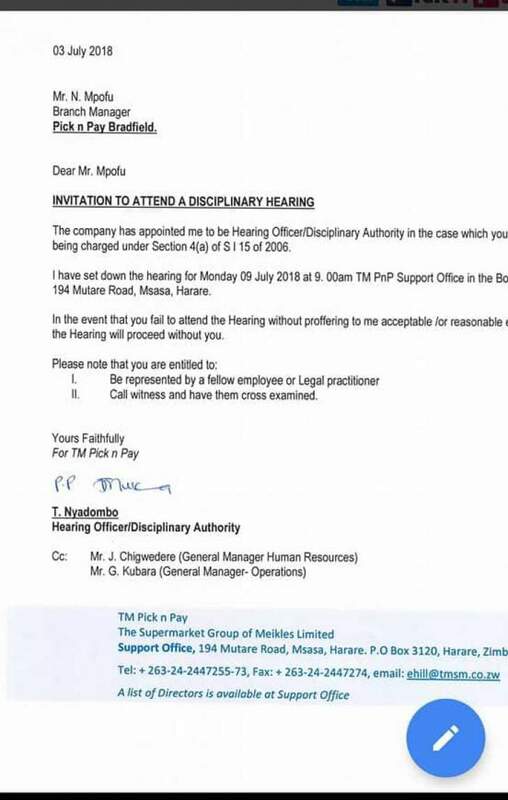 Mthwakazi Republic Party has said it regrets to announce that its efforts of bringing sanity to Pick N Pay have so far yielded no tangible results, as the company's management have since suspended Nhlanhla Mpofu effective today. According to impeccable sources Mpofu is being punished for authorising the employment of a few Ndebele workers into permanent employees. "Since it is not constitutionally a breach of law to employ Ndebele people, they then decided according to the dictates of the 1979 Shona Grand Plan to create a charge sheet for him to justify his suspension from work without salary and benefits until the finalization of the case," said party spokesperson Mbonisi Gumbo. "Mpofu received a letter today informing him about his pending disciplinary hearing to be held on the 7th of July in Harare. The company accuses him of providing tea to staff as well as merchandisers from other companies. He is further accused of selling launch at $1 a plate to staff and merchandisers as well as selling write offs/ wastages to staff members without authority." Gumbo said meanwhile a certain Benediction Masara have since taken over from Mpofu at Bulawayo Bradfield branch. "The Shona supremacists working in cahoots with a Mr Malcolm a white man who is the Managing Director in Harare's Pick N Pay Zimbabwe Headquarters, are on a mission to get rid of everyone from Matabeleland in the company, while they replace them with Shona people," he said. "Out of the retail giant's 56 branches only two supermarkets are led by people from Matabeleland. Many Ndebeles have been clandestinely fired, in unclear circumstances while being replaced by Shona people. Right now more than 95% of Pick N Pay Zimbabwe staff in Matabeleland and Midlands are from Mashonaland." "We can confirm that out of a total of 9 TM Supermarkets namely; Hypermarket, Bradfield, Ascot, Jason Moyo, Fife street, Northend, Lobhengula street, South World as well as Cowdray park, only two have Ndebele managers." "We have identified the chief tribalists as the General Manager Godfrey Kubara, Shadreck Matsvayi, and Benediction Musara, these are the ones feeding poison to Mr Malcolm all based in Harare." "As Mthwakazi Republic Party we stand by our people, we will defend and protect our people no matter the consequences. Pick N Pay will rather close shop and go back to Harare, everyone from Mthwakazi should not buy anything the satanic shop."